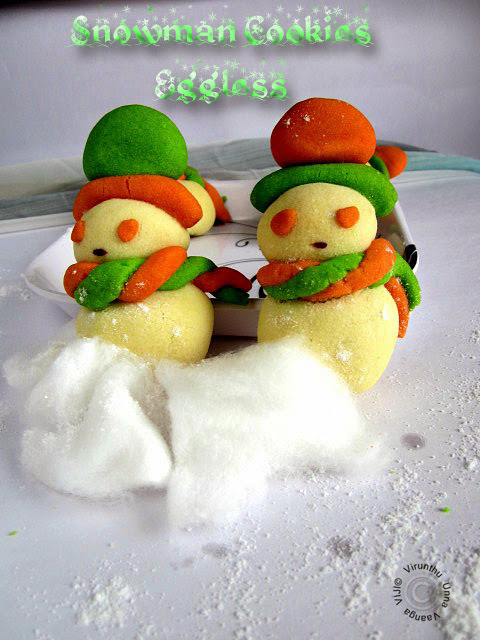 Hi friends, wish you all very HAPPY CHRISTMAS. Hope you all enjoying your Christmas with your friends and family. 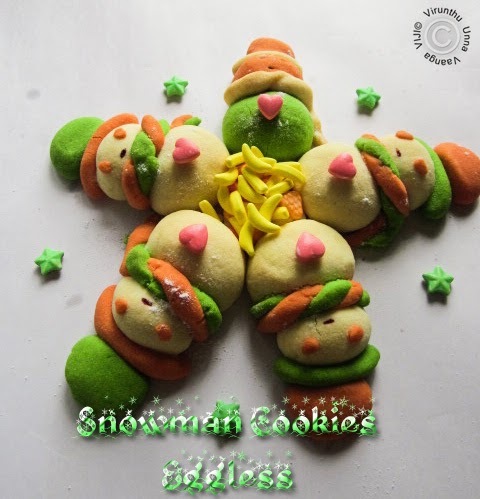 Here, is the treat for you from me, American Snowman Cookies, eggless version. 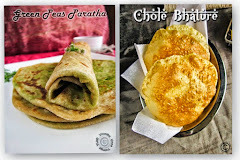 This is the second baking of this month HBC-Home Baker’s Challenge, which is initiated by +Priya Suresh akka. 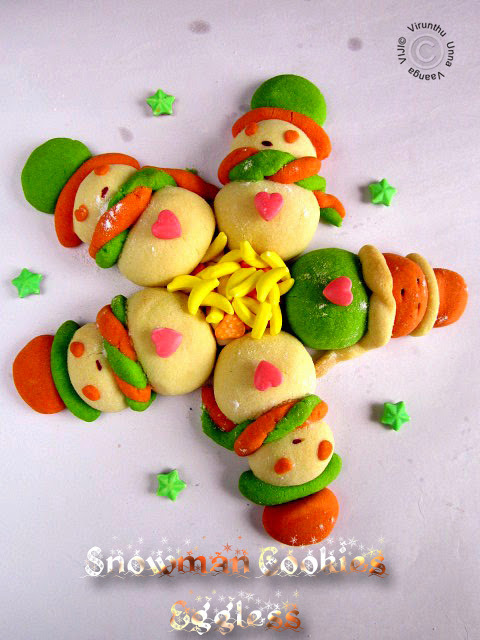 +Priya R from Cook Like Priya is the December month host, she have suggested varieties of traditional Christmas bakes. I already prepared Jewish braided challah-Eggless version, and this is the second one for the lovely Christmas. 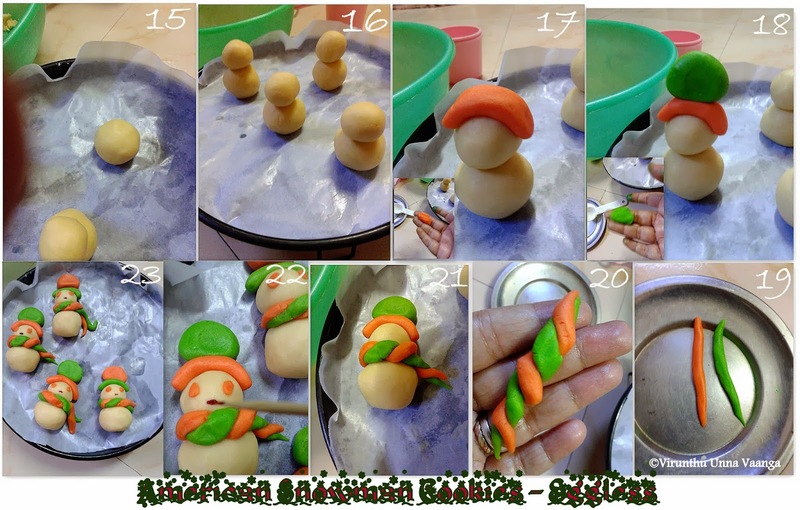 Making of the snowman cookies, takes quite long time while compared to other cookies. But, I bet, you will enjoy the entire process of the cookies preparation. Cream the butter and sugar in a bowl until they turns light and fluffy. 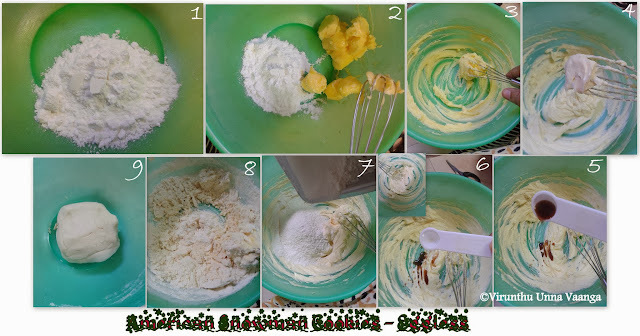 Add in the water and vanilla extract, gradually add the flour and mix well. Place 1/3 cup of dough in two small bowls. Add red food coloring in one and green to the other and mix until the dough turns red and green dough. Shape the remaining white dough as small balls and medium sized balls; I used ½ and 1 Tbsp respectively to make the balls. 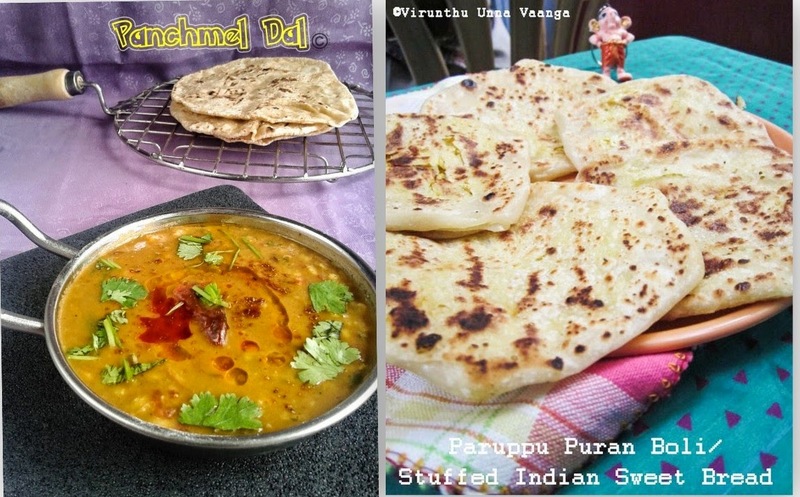 Place the smaller one above the larger ball on a baking sheet. Shape a small ball from the colored dough for hat and place it above the head as shown in the picture. Preheat the oven to 180° C/350 F.
For the scarf, shape each color as a rope, twist them together, leaving one end untwisted. 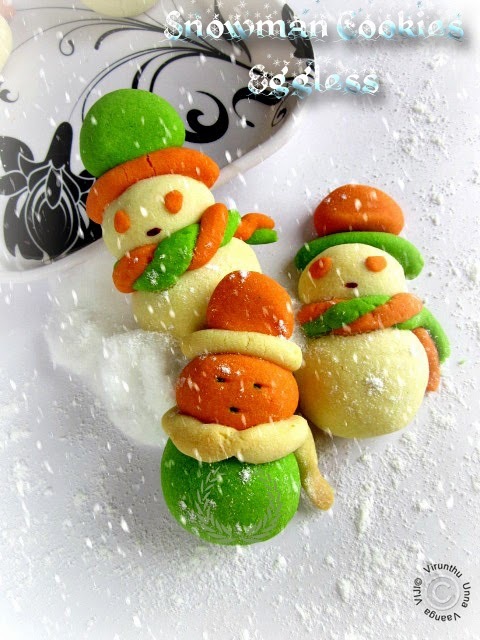 Place the scarf around the snowman’s neck. Place two rolled small dough for eyes and keep color mark for lips. 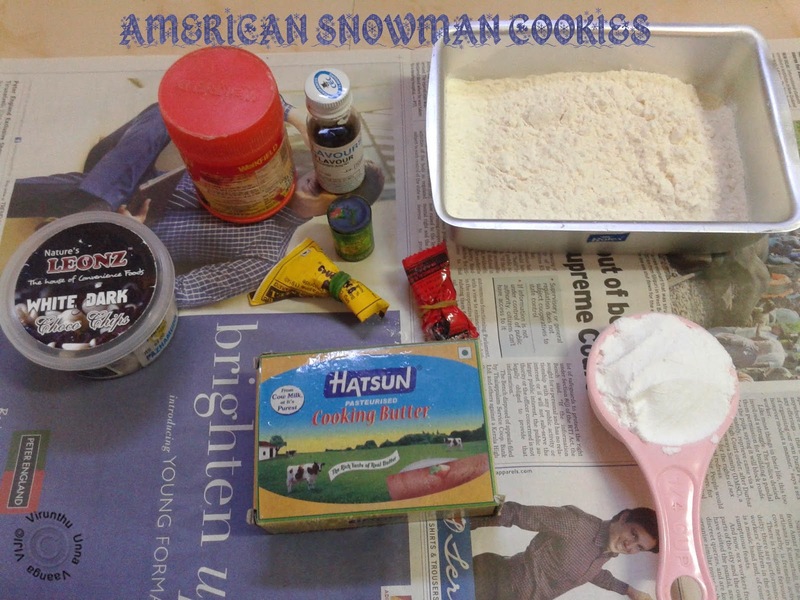 Use your desired color to make the cookies. If you have sprinkles, use it to place eyes. Temperature may vary oven to oven, so keep on eye after 12-14 minutes. 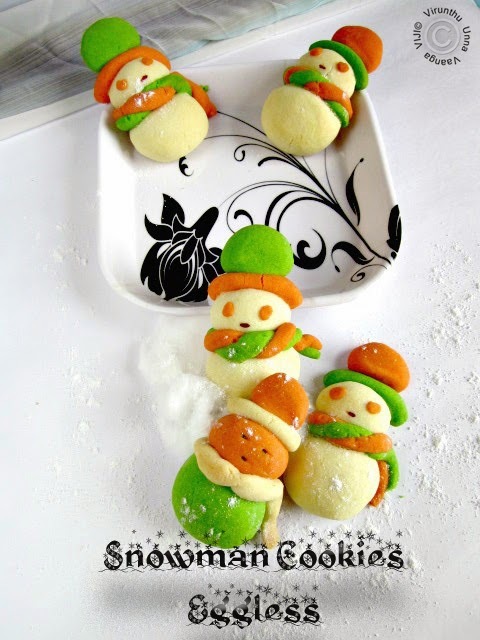 ENJOY THE COLORFUL SNOWMAN COOKIES!!! 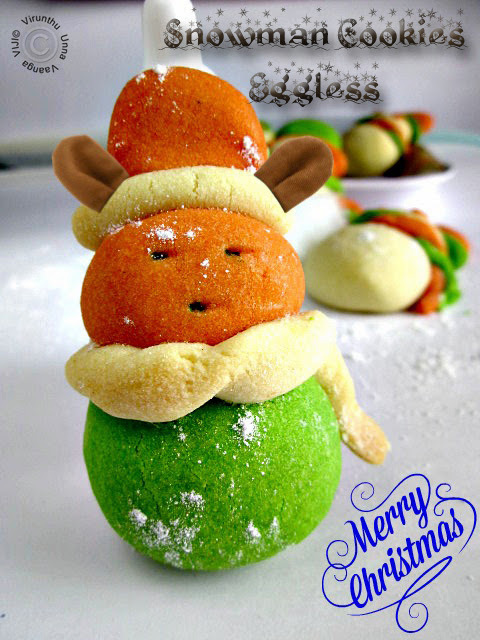 WISH U ALL VERY HAPPY CHRISTMAS!! !